Happy Themes Coupon gets you up to 40% OFF on their yearly and lifetime access package. HappyThemes are one of the latest WordPress theme providers with versatile themes focused towards blogging and magazine style themes. I already wrote HappyThemes Review explaining most features of their themes and also shared some best themes designed by them. This post- HappyThemes Coupon is focused to offer discounts for new buyers and please continue reading to know more about the HappyThemes Discount. HappyThemes released nearly 17 themes in 2018 and promised to release a similar amount of themes for 2019 & beyond. HappyThemes Yearly package costs $49 which gives access to all the WordPress themes for unlimited sites and also access customer support forum. Apart from it, you'll also get access to new WordPress themes released during your subscription period. 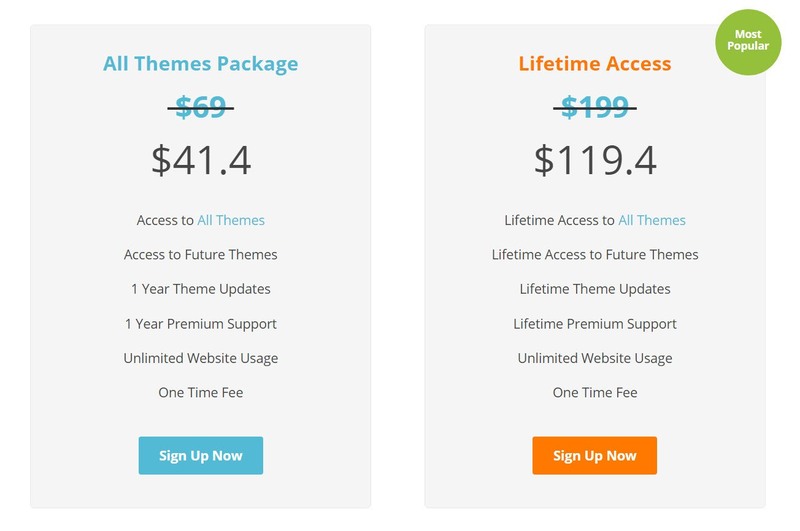 HappyThemes Lifetime package costs $99 which gives access to all the kinds of stuff explained above for your entire lifetime. You don't need to pay for renewal charges after the first year and considering the fact, the company launches 10-15 themes every year, you can have a lot of options. Now comes the HappyThemes Discount part. HappyThemes offers 40% OFF on both yearly and lifetime access package. I'm one of the early adopters of HappyThemes, so I got 75% OFF and they reduced their discounts to 50% recently. Once they hit a milestone, they'll further reduce the discounts to 25% or they'll cancel the lifetime membership access. The first best day to get your account was yesterday and the last best day to get your account was today. This HappyThemes Coupon post will be updated frequently with the latest available discounts, so even if you're planning to get an account later, revisit us to find the best deals on Happy Themes.